Despite the name which suggests Hindu leanings, this is actually the place of worship for five different religions - Christianity (one Protestant and one Catholic), Hinduism, Buddhism, Islam. This collections of churches, mosque, temple and vihara on the Hill of Prayer came about as a result of intense developmental activity in the nearby neighborhood that coincided with the Boom in the local tourist industry, which, in addition to tourists, was also bringing in a lot of migrant workers. It is quite fascinating to be able to contrast and compare the many different architectural styles of these religions. How popular is Puja Mandala? 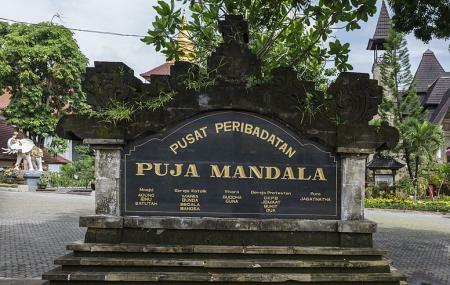 People normally club together Gunung Payung Beach and Jimbaran Bay while planning their visit to Puja Mandala. People also prefer to start their day with Puja Mandala. Amazing place in Jimbaran, south of Bali international airport. I didn't visit the Catholic Church or any other of temples close to it, most of them closed on that day. It's rare indeed that you may find in same small square a mosque for Muslims, that Catholic Church and also a Protestant church, and an Hindu temple as well as a budist one. 5 temples one next to the other, believe it or not! A very good sample of our Unity in Diversity theme .. different building for each major religion in Indonesia (exclude Confusianism as it wasn't recognized as legal religion when this place built) .. visited the Vihara to pray .. it was Theravada tradition .. maybe every cities in Indonesia should have similar place .. This is lovely example of multi religions functioning on a single property, each maintaining its own customs and personality. Nice to visit as a tourist and I wish more places come up like this. Perform Barong dance, Pendet dance, Legong keraton dance, start at 16:00 -17:00 @pura Jagatnatha, Every Tuesday and Thursday.